Cruise Nelson Harbour taking in the sites of the very unique naturally made Boulder Bank, historic Nelson Lighthouse, the region's fishing boats, and view the prestigious houses lining the Port Hills. Set out The Cut for a sail or anchor in the lee of Haulashore Island to enjoy a swim or a meal. 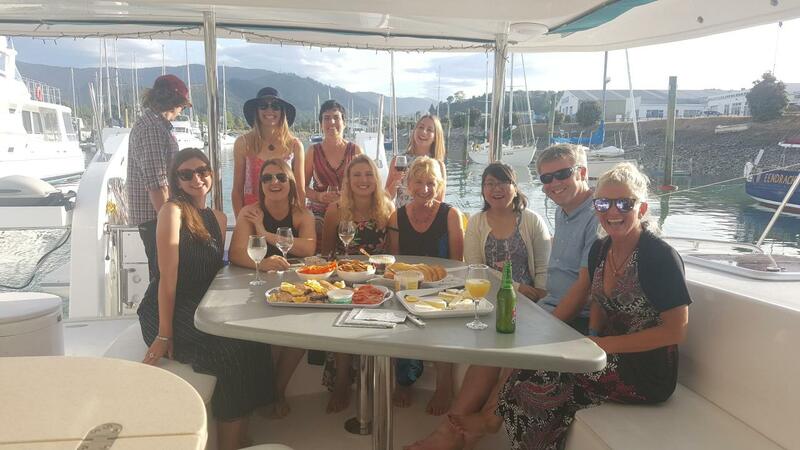 Enjoy a sunset evening sail while sipping cocktails and see Nelson lights by night. Experience the best of fresh local cuisine while cruising on the water. A fully serviced meal while you relax, impress, or discuss important matters.Whether you are out for a special occasion or celebration or wish to influence your guests or clients, let us host you. Sailing Catamaran Te Harinui is suited to host between 6 to 30 guests. Te Harinui is held to a very high standard and easily competes on the international stage, hosting both indoor and outdoor dining areas and seating as well as ample deck space. Popular harbour cruise departures are from 1pm - 3pm or 6pm - 9pm, however we are flexible in changing this time frame to suit you and your guests. Please let us know by email after booking online. Or see Nelson Harbour cruises on board classic catamaran Jamarh. *Price is based on a minimum charge of 3 hours, additional charter hours can be added after booking.